Superbowl Sunday is coming up quick and while football isn't really my sport, I am definitely excited to watch the big game because of the yummy snacks, funny commercials and amazing half time shows. I also love any opportunity to dress for an occasion - even for watching a football game! Since I don't have a particular team that I feel strongly about, I plan to re-wear this sporty look next Sunday during the Superbowl (#outfitrepeater). Just a Touch: If you're like me and don't have a team preference, but want to look sporty & festive for the big game keep your outfit simple, and use accessories to show your spirit. My New Balance sneakers & a backpack gave a sporty vibe to a varsity sweater & leggings. Switch up the colors of your accessories to show support for the team of your choosing! Super Fan: If you're a super fan of the Broncos or Panthers this year, show support for your team with a bright sweater in your team's colors. (Bonus points if you have a jersey to wear or add a team beanie or scarf to your look!) Finish off the outfit with some of the accessories I mentioned above & you'll be game day ready in no-time! Who are you rooting for this weekend? Broncos or Panthers? 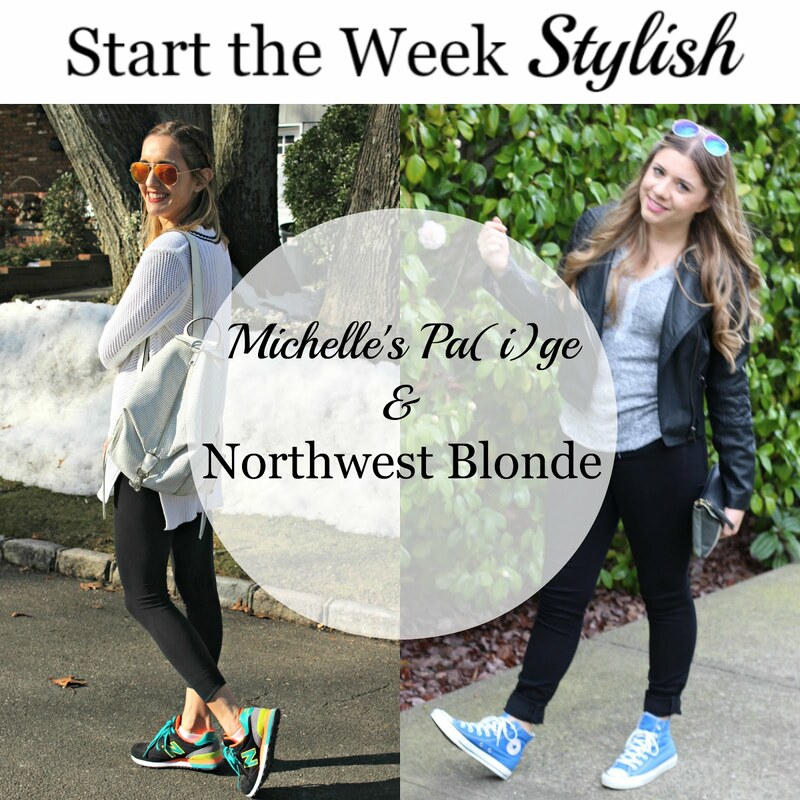 Meet our co-host for this week's Start The Week Stylish linkup: Rania from The Wardrobe Stylist. Rania is a Canada based blogger & wardrobe stylist who not only covers fashion but also fitness, beauty and home decor on her blog. Be sure to stop by her blog this week and say hello! Last week, we loved the way Yana from A Handful of Stories & Megan from Diary of this Girl styled fur. your whole look is gorge, but I'm dying over your shoes. Such a good fashion sneaker! This sporty chic look is super cute! I love your sweater and those shoes. Your backpack is also fantastic. Perfect look! Thanks for the linkup. Have a wonderful day! So glad to hear you are a fan of this look! Always looking so adorable - love the sweater! Have a great week! Love the sporty vibes! I'm all about the food and commercials when it comes to the super bowl. Me too! Appetizers are the best kind of food & the Superbowl is full of them! Fun sporty look, love those fun sneaks! Loving this look for Superbowl Sunday! I plan to rewear it again on Sunday! I love it! How fun are those sneaks? The colors are so great too! LOVE this athletic casual look! Your sneakers are amazing! I love this V neck sweater and those runners are too cute! I think this is a great sweater to wear for a SuperBowl party. I'm also loving your braid and that bag. Love your sneakers and dying over your backpack! Such great details! I'm loving the sporty vibe, and that sweater is perfect! Since my team isn't in the Super Bowl this year, I'll probably be wearing a similar look! Plus I'm so excited for the food! NY teams aren't in it either, so a neutral but sporty look is perfect for me! Loving this sporty look on you and that backpack is so chic! This is such a cute sporty chic look! Love your sweater and that backpack! Thank you! I love the neon pops in them! Can't wait to check out your NB sneakers!